The Artifact Matrix provides a standards-indexed™ and standards-referenced™ view of how artifacts apply to standards and their criteria/components. 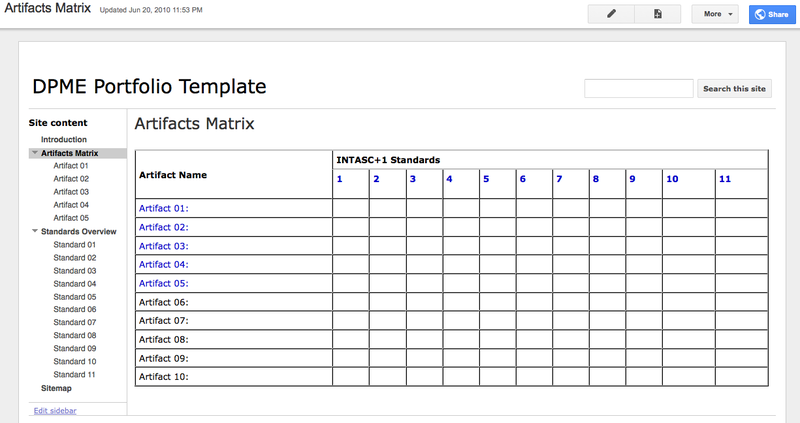 This matrix is a quick-view of standards and artifacts alignment as well as the navigational hub of DPME templates. Under the column labeled Link are previously created links to Artifact Pages. Under the columns labeled Standards are previously created links to individual Standards Pages. In each artifact row, mark an "x" in each each standard column that is relevant.